Antiaircraft refers to surface-to-air weapons systems. During the Second World War, these were almost exclusively guns of various kinds, although barrage balloons saw some use and the Japanese equipped their ships with antiaircraft rockets late in the war. Antiaircraft guns are divided into light and heavy categories, and sometimes the lighter guns are classified as light and medium. Heavy antiaircraft guns fired large shells to high altitudes, with the detonation timed to destroy the enemy aircraft with a rain of shrapnel. Early antiaircraft shell fuses used a powder train to time the detonation, but these were both highly variable and prone to dud; and by the time of the Pacific War, heavy antiaircraft shells used much more reliable mechanical time delay fuses. The Allies revolutionized heavy antiaircraft artillery with radar direction of the guns and by adding a tiny radar fuse to the shell itself. This set off the shell when it passed close to an aircraft. These VT shells were three times as effective as ordinary timed shells in spite of a high dud rate. Warship designers faced a dilemma with the heavy antiaircraft batteries of their largest warships. These warships needed to be able to fend off fast-moving destroyers and motor torpedo boats as well as aircraft. There were obvious advantages to having separate batteries optimized against each kind of target, but there was also the disadvantage that fewer guns of either type could be shipped. The major participants in the Pacific War chose instead to install dual-purpose secondary batteries on most of their large warships, accepting the challenge of designing a gun effective against both ships and aircraft in order to allow the entire secondary battery to be used against either kind of target. Light antiaircraft guns were designed to hit aircraft at shorter ranges and traded weight of shell for rapid traverse. The lightest guns in use at the start of the war were large-caliber machine guns firing a solid shot, which proved almost useless. 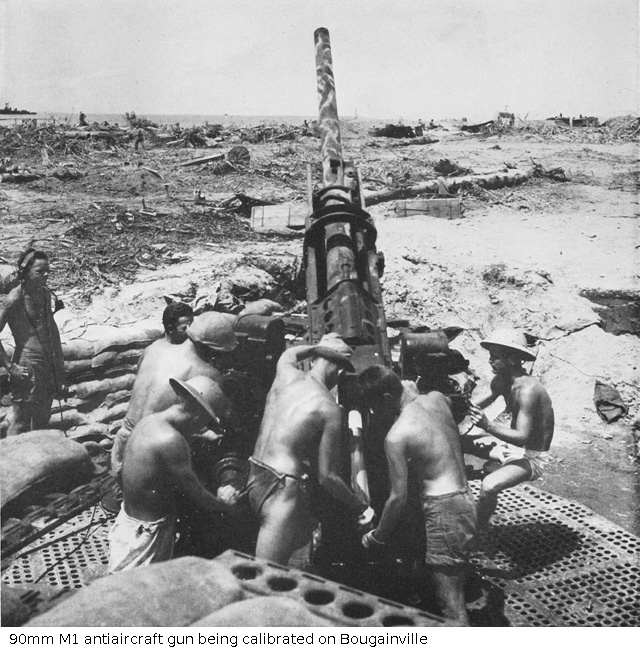 Later light antiaircraft guns fired contact-fused explosive shells. Like solid shot, these had to actually hit the target to damage it, but they packed much more punch. The typical caliber for a light antiaircraft gun was around 20mm, which was large enough to carry a useful explosive charge yet small enough to be shoulder controlled. However, as the demand for antiaircraft firepower increased, light antiaircraft guns began to be mounted in multiple barrel powered mounts. Medium antiaircraft guns were guns of around 40mm caliber that otherwise resembled light antiaircraft guns. One might anticipate that these would combine the worst features of light and heavy antiaircraft guns, but in fact the 40mm Bofors used by the Allies was quite successful, especially against the kamikazes. The best heavy antiaircraft naval gun of the war was the U.S. 5”/38 dual-purpose gun, which was often radar-directed and fired VT shells. The best Japanese heavy antiaircraft naval gun was the 3.9”/65 dual-purpose gun, but this was neither as effective as the 5"/38 nor available in adequate numbers. The best medium gun was probably the Bofors, while the Allies relied on the 20mm Oerlikon for light antiaircraft duty. The Japanese never developed a medium antiaircraft gun, relying on their dismal 25mm/76 antiaircraft gun to the end of the war. 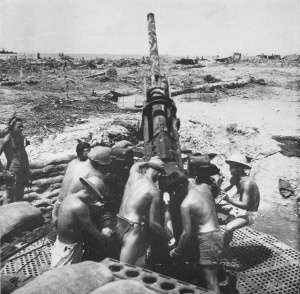 American ground units in the Pacific were equipped with the 90mm M1 antiaircraft gun. This gun weighed 9.5 tons and fired the M71 antiaircraft round to a maximum altitude of 39,510' (12,040 m) at a rate of up to 20 rounds per minute. The M71 shell weighed 23.40 lbs (10.61 kg) with a 2.04 lb (0.93 kg) TNT bursting charge, with the complete fixed round weighing 42.04 lbs (19.07 kg). The 90mm M1 was also supplied with an armor piercing round capable of penetrating 4.8" (120mm) of homogeneous armor at 1000 yards (914 m), but this was rarely used in the Pacific. In 1944 a proximity fused shell was introduced, but there was considerable reluctance to authorize its use anywhere where a dud shell might fall behind enemy lines, be captured, and have its secrets revealed. Unguided antiaircraft rockets were largely unsuccessful. The antiaircraft rockets that the Japanese added to their surface ships apparently did not shoot down a single Allied aircraft. The numbers of antiaircraft guns shipped at the start of the war proved grossly inadequate. As it became increasingly clear that ships were highly vulnerable to air attack, both the number and quality of light and medium antiaircraft guns was increased. U.S. ships that reported to a yard for repair or overhaul usually shipped additional antiaircraft guns. The Japanese also added large numbers of light antiaircraft guns to their ships as the war progressed, but these were generally not as effective as American weapons. Further gains in antiaircraft firepower were achieved by adding more and better directors for the guns. The ultimate limit on how many guns could be shipped was determined by a combination of deck space; maximum allowable top weight; and, on heavier warships such as battleships, the need to leave clear arcs of fire for the main armament. For example, Yamato required special antiaircraft gun mounts to withstand the terrific blast of its 18.1" main armament, but by the end of the war, the Japanese were crowding her deck with additional antiaircraft guns whose ability to survive beyond the first broadside was questionable. Another challenge with mounting large numbers of guns wherever they could be bolted down was ensuring that they had an adequate ammunition supply. This was not just a question of magazine capacity, but also of getting the ammunition from the magazines to the gun mounts. The U.S. Navy was reluctant to place guns far from the superstructure, with its ammunition scuttles, until bitter experience showed that it was sufficient to supply such guns with a good supply of ready ammunition. A critical element of any antiaircraft gun was its fire control. Heavy antiaircraft guns had complicated directors, often separate from the gun itself, that calculated the proper lead so that the shell and its target would arrive at the same point in space at the same moment in time. The director also controlled a fuse setter for timed shells that set the shell to detonate just before the estimated moment of closest approach. Both lead calculation and fuse setting required an accurate estimate of the range to the target, which was originally provided by an optical range finder. These were of limited accuracy compared to radar range finders. Most of the major powers had adopted stereoscopic rangefinders by the time of the Pacific War. Stereoscopic rangefinders worked like a pair of binoculars, with two eyepieces. The observer's eyes and brain brought the images into coincidence, and range was obtained using a set of marks in each eyepiece that were adjusted until they appeared to be at exactly the same range as the target. The British clung to coincidence rangefinders, not acknowledging until 1943 that this was a mistake. In a coincidence range finder, the images from the two telescopes were combined in a single eyepiece. The observer selected sharp vertical features in the images, were continuous across the boundary between image. This was difficult with aircraft, whose most prominent feature was the horizontal wing. Naval antiaircraft directors had the additional challenge of compensating for the rolling of the ship, which was accomplished using gyro stabilization. The British drones, de Havilland Moths fitted with radio controls, were known as Queen Bees. They were highly prized, which had the perverse effect of limiting the amount of test firing conducted against them for fear of actually shooting them down. As a result, the British were slower than the Americans to realize that their antiaircraft shells were much less lethal than suggested by static ground tests. The Queen Bees were eventually improved to be able to dive at 40 degrees at a speed of 175 mph (280 km/s), but the British were never successful in their efforts to operate the Queen Bees in pairs to simulate a mass attack. The British and Americans both experimented with laddering their antiaircraft salvos, that is, firing several quick salvos over a spread of ranges to see which came closest to the target. This was a viable technique in surface fire control, but the Americans concluded that laddering of antiaircraft fire meant a greater likelihood of a hit but a lower likelihood of actually destroying the aircraft, since several hits were typically required to put enough shrapnel into the aircraft to destroy it. Light antiaircraft guns were originally equipped with very simple sights, and the gunner determined the correct lead on the target by observing his tracer rounds and adjusting his aim accordingly. Fire control was rapidly improved with gyroscopic sights, where the gunner simply followed the target with his gun sight. The gyros automatically measured the motion of the gun sight and added the correct lead. 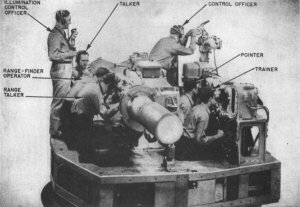 By the end of the war, U.S. light antiaircraft was being equipped with radar directors that had full blind-fire capability. The U.S. Navy fielded the best heavy antiaircraft director of the war, the Mark 37. It employed a direct angular rate computer resembling a Norden bombsight (and apparently first proposed by Carl Norden.) The battleship version had heavy splinter protection (1.5" or 38mm of STS) but the destroyer version had only weather protection (a 0.5" or 13mm shield). The director reduced top weight by moving the computing element below decks and the fuse setter was incorporated into the shell hoists in the turrets. The computer could handle aircraft speeds up to 400 knots (460 mph or 741 km/h) which remained adequate until the Ohka was introduced in the final months of the war. However, the original model proved a failure due to an unexpected feedback loop between the director and computer that introduced instability. The problem was corrected by the time war broke out in the Pacific, but many destroyers in the period 1939-1941 were completed with empty director barbettes while they awaited their Mark 37s. Eventually production caught up and a few were even provided to the British as Lend-Lease. The Mark 37 was originally equipped with the Mark 42 stereoscopic range finder, but it was already being equipped with Mark 4 radar in late 1941. The director proved well adapted to repeated upgrades with improved radar range finders. Older ships had to make due with the Mark 33, which required its operators to enter corrections manually. Mark 33 was rarely replaced on existing construction by the Mark 37, and it remained in production until the end of the war for ships lacking space below decks for a Mark 37 computer. The Mark 44 director, a simple gunsight director, was used to direct light antiaircraft early in the war. The Mark 14 and Mark 15 gyrosights were used on the 20mm Oerlikon and were also incorporated in the Mark 51 and Mark 52 directors for the 40mm Bofors. The Mark 51 was often cross-connected to a warship's 5"/38 guns to give them some usefulness against targets at short range (less than 3000 yards or 2700 m), where the Mark 37 was increasingly inaccurate. Starting in 1943, the 5" guns also had their own local directors to allow the guns to engage multiple targets and thus reduce the chances of the heavy antiaircraft defense becoming saturated. The British relied on the High Angle Control System (HACS), which was first tested in 1926 and officially adopted in 1929. The system consisted of one or more directors high in the ship, a High Angle Calculating Table (HACT) which was the main fire control computer, and connections to the guns. The director contained a coincidence rangefinder, a cross-roll periscope to compensate for ship motion, and telescopes for the trainer, layer, and control officer. The control officer was expected to estimate the angle of presentation of the target, which was the angle between the target course and the line of sight (and thus equivalent to inclination of a surface target.) All this went into the HACT, which generated predicted positions that could be compared with the actual target motion to correct the fire control solution. By the time war broke out in the Pacific, the newest model was HACS IV, with HACS III still installed on many older ships. Destroyers were equipped with the simplified FKC system, which resembled HACS but without the plot required for synthetic fire control. British "pom-pom" light antiaircraft guns used the Mark II director, which was a simple noncomputing "gunsight" director similar to the U.S. Mark 44. Japanese antiaircraft fire control was poor throughout the war. The Japanese started the war with the Type 94 director for heavy antiaircraft, which proved much too slow. After the disaster at Midway the Japanese Navy rushed development of the Type 3 director, but the prototype was never completed. The Type 95 director for light antiaircraft was available only for triple 25mm mounts, all others using open ring sights. The low quality of Japanese antiaircraft fire control was manifest at the Battle of the Sibuyan Sea, when only 18 Allied aircraft were shot down out of hundreds attacking a Japanese force carrying literally hundreds of antiaircraft barrels. U.S. Navy antiaircraft doctrine called for heavy antiaircraft to deliver either aimed fire at individual targets ("continuously pointed fire" or "shoot to hit") or barrages in the path of oncoming aircraft formations. The latter became largely obsolete with the introduction of proximity fused shells. The heavy guns typically did not open fire until the targets were at a slant range of about 10,000 yards (9000 meters). At these ranges, nearby screening ships could make a significant contribution to defending the principal targets. Light antiaircraft was only effective to a maximum of 2000 yards, so only the light antiaircraft of the target ship had any real chance of hitting the attacking aircraft. Furthermore, 2000 yards was the approximate range at which dive bombers and torpedo bombers released their ordnance, so most kills by light antiaircraft were "revenge kills" of aircraft that had already carried out their attacks. The Japanese, with their lack of proximity fuses and generally inferior fire control, almost always laid down barrages with their heavy antiaircraft guns. These proved as ineffective for the Japanese as they had been for the Americans. Together with the inferior 25mm light antiaircraft guns,Japanese naval antiaircraft became increasingly inadequate as American aircraft became faster and more rugged. An important and ironic difference in doctrine between the American and Japanese navies lay in the use of maneuver to avoid air attack. 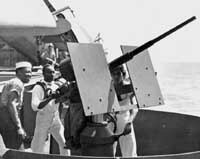 In American carrier task forces, the escorting warships understood that they were to maintain station to protect the carriers at all costs, relying on their antiaircraft guns for point defense. Japanese escorting warships tended to maneuver independently of their carriers when under air attack, breaking up the formation, complicating fire control, and leaving the carriers vulnerable. The threat of air attack also led to modified fleet tactics. The Americans adopted a circular formation for task forces that maximized the effectiveness of their antiaircraft batteries, and the Japanese followed suit. As American fleets grew larger, fire control doctrines were worked out to ensure that ships were able to concentrate their fire without hitting friendly aircraft or each other. By 1944, the combination of Hellcats and improved antiaircraft made American task forces all but impregnable to conventional air attack. One Japanese response to improvements in Allied antiaircraft was night torpedo attack by long-range land-based naval bombers such as the G4M "Betty." These tactics proved effective at the Battle of Rennell Island and remained a threat almost to the end of the war. The response was to post radar pickets far enough from the task force core to give adequate warning. Kamikaze attack was another matter. Radar pickets posted away from the core of a task force could not contribute their antiaircraft fire to defense against diving or gliding attacks and were themselves highly vulnerable to attack. Furthermore, a kamikaze attack could be repelled only by so severely damaging the aircraft that it was forced off its attack trajectory. The Oerlikon proved inadequate for this task, and even the Bofors did not always disintegrate the aircraft in time. The U.S. Navy began developing a 3" antiaircraft gun whose autoloader gave it a rate of fire of 50 rounds per minute and whose shells were just big enough to use a radar proximity fuse, but the war ended before it went into production. One fleet tactic devised to counter the kamikazes was the picket destroyer with local fighter combat air patrol. A single destroyer with modern radar was stationed along a likely threat axis at some distance from the main fleet, and two or more fighters were assigned to fly continuous patrol over the ship. In theory, the destroyer gave early warning of incoming raids and the fighters protected the destroyer. In practice, the early warning proved highly useful, but the incoming kamikazes tended to attack the picket destroyer rather than the more valuable targets beyond, and the fighter cover and the destroyer's own antiaircraft defenses often proved inadequate. As a result, picket destroyers took terrible casualties, and there were clear indications of declining morale among destroyer crews during the Okinawa kamikaze battle. An alternative to picket destroyers was airborne radar, but radar powerful enough to have an adequate detection range and light enough to be carried in an aircraft was not developed until the war was almost over. Had the Allies been forced to invade Kyushu, their invasion forces would have been given early warning by TBF Avengers equipped with the CADILLAC radar system. The rapid growth in antiaircraft armament strained logistics. For example, on 11 November 1943, a raid by about 110 Japanese aircraft engaged an American carrier group that had just conducted a raid on Rabaul. During the 46 minutes of the battle, the three carriers in the group expended 748 rounds of 5" ammunition, 8747 rounds of 40mm ammunition, and an incredible 33,552 rounds of 20mm ammunition. The American fleet had an impressive service force for keeping up with demand, but the Japanese encountered serious difficulties in this area. Japanese staff officers interviewed after the war told American historians that the Yokosuka, Kure, and Sasebo munitions depots were completely emptied of 25mm ammunition when Japanese ship magazines were fully loaded out for the impending conflict. This was not solely a Japanese problem; the CINCPAC summary for 10 December 1941 notes that the supply of 0.50 machine gun ammunition at the naval ammunition depot at Pearl Harbor was already exhausted. However, the Japanese had considerably more difficulty keeping up ammunition stores than the Americans. By 1944, Japanese ammunition loadouts were restricted to about 100 rounds per heavy antiaircraft gun and 1000 rounds per antiaircraft machine gun. This corresponded to about 17 minutes of rapid fire from the heavy guns and just 10 minutes for the light guns. The consequences for Japanese air defense against repeated American air strikes seems obvious. The British also struggled with logistics. During the evacuation of Crete in the Mediterranean, the British fleet expended a third of its entire antiaircraft ammunition reserve in less than 48 hours. Zimm speculates that the more modest expenditure in 1942 reflects a combination of slower, more vulnerable aircraft and a greater tendency to hoard ammunition early in the war. The official U.S. Army history of the New Georgia campaign (Miller 1959) makes the claim that twelve Japanese bombers were shot down using 88 rounds of 90mm antiaircraft ammunition when they incautiously approached a thoroughly alerted antiaircraft battery on Rendova on 4 July 1943. The VT proximity fuse was not yet authorized for use by land forces and the SCR-584 radar director was not yet available in the Pacific, making the specifics of the claim highly questionable. However, it is credible that Allied antiaircraft was proving increasingly deadly by this point in the war.